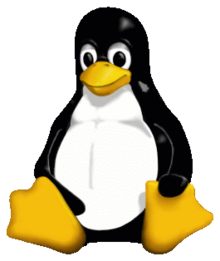 Tux is a penguin character an the offeecial mascot o the Linux kernel. Oreeginally creatit as an entry tae a Linux logo competeetion, Tux is the maist commonly uised icon for Linux, altho different Linux distributions depict Tux in various styles. In video gemmes featurin the character, female counterparts named Penny an Gown accompany him. The character is uised in mony ither Linux programs an as a general seembol o Linux. This page wis last eeditit on 23 Dizember 2013, at 23:37.